Located in a 250 acre canyon in the heart of the El Dorado wine region, Saluti Cellars Vineyards, Winery and Bed & Breakfast Inn offers distinctive, award-winning estate wines in a friendly, relaxed atmosphere. Our beautifully landscaped grounds and panoramic vineyard views provide a picturesque setting for intimate vineyard weddings overlooking vineyards and ponds or an elegant barn venue wedding, romantic weekend getaways or extended wine country vacations. Picnic grounds, gazebos, picnic tables, a bocce ball court, horseshoe pit and hiking trails are also available for our guests’ enjoyment. Saluti provides two unique venues for intimate and romantic wedding ceremonies, receptions and other special celebrations. You may choose to exchange your vows under a rose-laced arbor overlooking a tranquil pond, with panoramic vineyard views and beautifully landscaped grounds. Or, you may prefer a more casual “country chic” wedding under our beautiful timber pavilion. Rustic, yet elegant, this venue is lit by western style chandeliers, faces a pond and is towered by an authentic antique windmill. 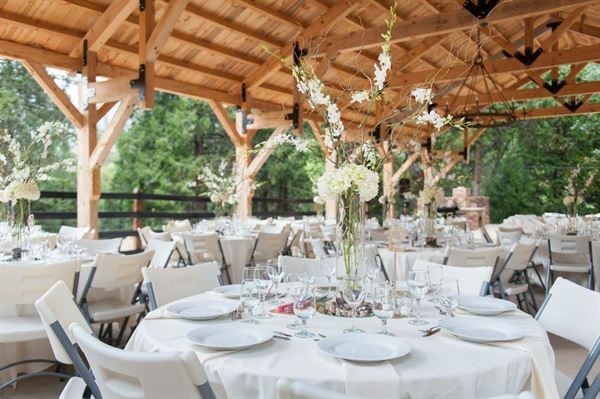 Regardless of which venue you choose, Saluti Cellars will make every effort to accommodate your needs to ensure that your special day is everything you dreamed it would be. Our facility rental includes: • White wedding chairs • Round tables for comfortable banquet seating • Tables for food service, gifts and guest book • Wine barrel with glass top for cake • Complete set up and breakdown of tables and chairs • Elegant wine stemware • Up to four hours of bar service • Romantic outdoor lighting • Exclusive use of facility from 6:00 p.m. to 10:30 p.m. • Ample parking for guests • Two hours prior to event for decorating • One hour assisted rehearsal the day before your event • Use of wine cave or outdoor areas for rehearsal dinner • Wedding ceremony coordination • A classic antique wagon pulled by a restored antique tractor and can bring the bride or bridle party to the ceremony for a grand entrance. • Outdoor heaters (available for an additional charge) • Saluti Cellars can assist you with your transportation and lodging needs. For pricing information or to schedule a personal tour of our property, please contact us.